Other photos: SALON LOOKING FORWARD, DINING TABLE, GALLEY LOOKING FORWARD, PORTSIDE CONVERTIBLE SOFA, STARBOARD SIDE SALON, 55" TV IN UP POSITION, SALON LOOKING AFT, GALLEY, GALLEY, GALLEY LOOKING TO PORT, GALLEY LOOKING AFT, GALLEY PANTRY, STARBOARD SIDE OFFICE AREA, PILOTHOUSE, HELM STATION, DOUBLE HELM SEAT, PILOTHOUSE WINE COOLER, STAIRS TO FLYBRIDGE, HELM TO PORT, HELM PORTSIDE, HELM CENTER, HELM STARBOARD, HELM ABOVE, FORWARD ACCOMMODATION STAIRS, DAY/VIP HEAD, VIP, VIP TO STARBOARD, VIP TO PORT, VIP STORAGE, CREW/FOURTH CABIN, CREW/FOURTH HEAD VANITY, CREW/FOURTH CABIN SHOWER, COMPANIONWAY LAUNDRY, MIDSHIP VIP LOOKING FORWARD, MIDSHIP VIP TO PORT, MIDSHIP VIP TO STARBOARD, MIDSHIP VIP STORAGE, MIDSHIP VIP HEAD VANITY, MIDSHIP VIP JACUZZI/SHOWER, SALON STAIRS TO MASTER, COMPANIONWAY TO MASTER, MASTER LOOKING AFT, MASTER LOOKING STARBOARD, MASTER LOOKING PORT, MASTER LOOKING FORWARD, MASTER TV, PORT MASTER HEAD, HONEY ONYX SHOWER, HONEY ONYX SHOWER, NEW FIXTURES, SHOWER LOOKING TO PORT, SHOWER SEAT, STARBOARD MASTER HEAD, FOREDECK, FOREDECK, BOARDING AREA, GREAT SHINE!, ARCH EQUIPMENT, AFT DECK TABLE, AFT DECK LOOKING PORT, AFT DECK LOOKING STARBOARD, CUSTOM AFT DECK BENCH SEAT, AFT DECK STARBOARD, SPORT DECK STEPS, SPORT DECK, SPORT DECK, STERN SHOT, LAZARETTE LOOKING TO PORT, LAZARETTE LOOKING TO STARBOARD w/DIVE COMPRESSOR, FLYBRIDGE LOOKING AFT, FLYBRIDGE LOOKING FORWARD, FLYBRIDGE STARBOARD SEAT, FLYBRIDGE PORT SEAT, FLYBRIDGE BAR, FLYBRIDGE STARBOARD FORWARD, FLYBRIDGE STARBOARD BAR, FLYBRIDGE PORT BAR STORAGE, BLUE ARCH AND HT LIGHTS, CUSTOM "BLUEWATER" TABLE, COVERS FOR ALL, COVERS FOR ALL, FLYBRIDGE HELM, FLYBRIDGE HELM, HELM TO PORT, HELM CENTER, HELM TO STARBOARD, BOAT DECK GAS GRILL, WAVE RUNNER, 2010 AQUASCAN TENDER, STARBOARD ENGINE, PORT ENGINE, WATERMAKER, OUTBOARD PORT ENGINE, CUSTOM ENGINE ROOM SEALING, SUPERIOR CONDITION, CAT GAUGES, GENERATOR ROOM AFT GEN, GENERATOR ROOM AC UNITS, GENERATOR ROOM FORWARD GEN, UNDERWATER LIGHTS, Feb 2019 Yard Visit, Feb 2019 Yard Visit, Feb 2019 Yard Visit, Feb 2019 Yard Visit, Feb 2019 Yard Visit, Feb 2019 Yard Visit. 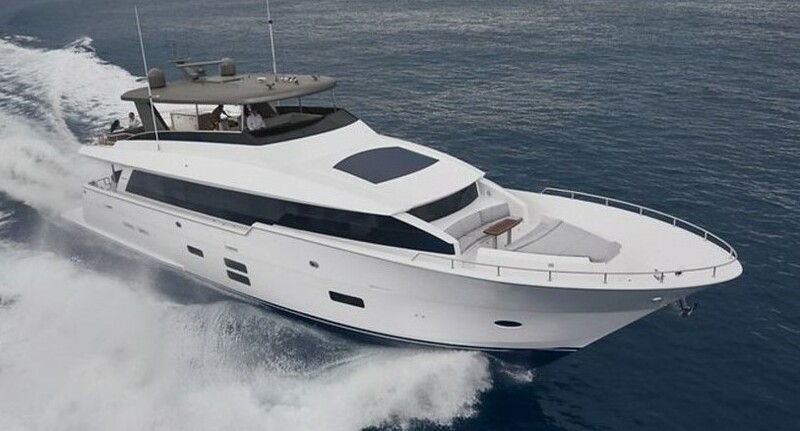 PRECIOUS LADY is a very special 75’ Hatteras. She has enjoyed conscientious and generous owners who have lavished her with improvements and care. A look through the equipment list and photos will most assuredly create a desire for a personal inspection. Being a 2002 model she has a walk in full beam Lazarette. This invaluable storage area is a great upgrade from older models. She was purchased in the Fall of 2016, refitted to their taste but before any use the boat they had always dreamed about became available. Her new $17,000 Master shower has yet to be used! Ready to go now, PRECIOUS LADY is certainly the best of the best available in this model lineup. Easy to see in Ft. Lauderdale.